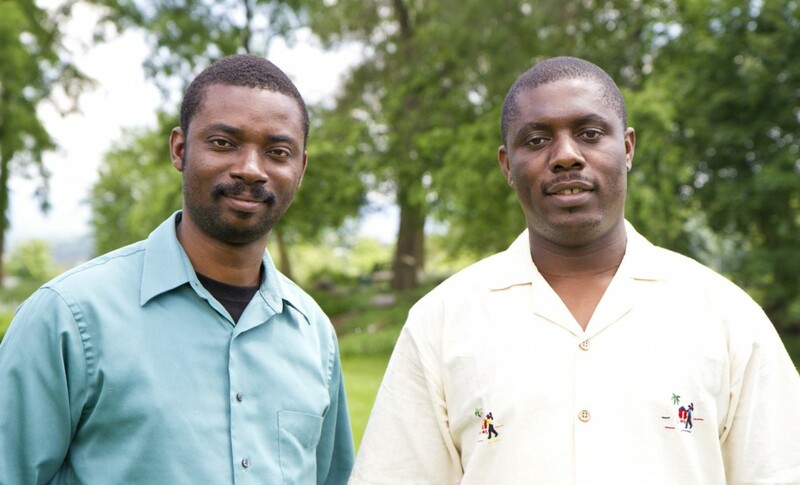 Harry Thélusma, left, and Garly Michel, who are both alumni of EMU’s Summer Peacebuilding Institute, said their biggest wishes for the future are prayers for Haiti and continued financial support that will allow them to continue STAR trainings beyond the end of the initial three-year pilot program in September 2013. Photo by Jon Styer. With a history of violence linked to colonization, intense poverty and vulnerable geographic location, Haiti has long suffered from natural disasters, social conflict, and other traumatic events. That is one reason more than 1,000 Haitians have welcomed trainings, materials and principles derived from Eastern Mennonite University’s STAR, which stands for Strategies for Trauma Awareness and Resilience. Using STAR curriculum translated and contextualized for Haiti, project staff have taught basic trauma awareness and response skills to a core group that exceeds 1,000 volunteers, including Reginald, many of whom are now putting the concepts to work in their own communities. Enthusiasm for the trainings – sponsored by six Christian organizations including Mennonite Central Committee (MCC) – demonstrates the profound need for trauma work in Haiti, as well as STAR’s relevance across cultures and contexts, say several people affiliated with the project. “It is really a blessing. It is really amazing to have this kind of program in Haiti to contribute to the construction of human beings as well as the resilience of the Haitian people,” says Garly Michel, the program coordinator with the STAR project in Haiti who is overseeing trainings throughout the country. The three-year project, now entering its final year, was launched in the aftermath of the 2010 earthquake that killed 316,000 and left 1.5 million homeless, according to Haitian government statistics. Originally focused on the areas most affected by the earthquake, Michel says the project’s scope soon expanded to include all 10 départements, or states, in Haiti. “We’d like to see a non-violent, healthy and resilient Haiti where each Haitian feels comfortable, safe and proud to live,” says Harry Thélusma, program officer with the STAR project in Haiti. STAR founding director Carolyn Yoder says one reason STAR principles can be so widely applied is that they address basic, universal human responses and reactions to pain and hurt. Yoder, who now works part-time with STAR as its systems developer, joined Barge in Haiti in the early fall of 2012 where they trained 15 facilitators who will continue work with the larger group of STAR participants in the country. In the coming year, Michel says he and his colleagues plan to provide STAR training to at least 480 more people. Michel and Thélusma, who are both alumni of EMU’s Summer Peacebuilding Institute, said their biggest wishes for the future are prayers for Haiti and continued financial support that will allow them to continue STAR trainings beyond the end of the initial three-year pilot program in September 2013. Virginia, there are a couple of things you should check out. One is our free webinar series (http://www.emu.edu/cjp/restorative-justice/webinar-series/) and the other is our online courses being offered in the spring (https://www.emu.edu/cjp/restorative-justice/online-courses/).